Again and again, this post for me is none other than the cry of my soul. I am struck by the fact that some things from everyday life used by us for granted. We believe even in lie. Take the formula, substitute the value and it works (so far, seems to be :). People, stop! “But all is working right!” – You might say. “Smart guy from the forum said that everything will work perfectly!”. Perhaps smart guy is right, but as the classic said “Do not trust anyone!”. Should you trust me? – It is really possible, but after rechecking. After all the task of the engineer not only to create something but also deeply understand the running process. As an example of “it should work!”, we will consider the recursive formula for the sine wave generation, which I have repeatedly seen on many websites and blogs dedicated to digital signal processing. Naturally, I checked this formula in practice and was really surprised by such simplicity. It really works! I was so amazed that could not resist and set out myself to understand the magic of the miracle formula. I was not very surprised when the clear and simple way of the formula deduction was not found in the network. Found a lot of absurdities, empirical and deductive methods and other “rubbish” but for myself – NOTHING. For experts (somehow reading this) I have to say that the method of obtaining a formula that is based on 2 poles immediately from Z plane and taken symmetrically with respect to the real coordinate axis specifically for me was absolutely incomprehensible method, with many author’s assumptions taken by me again on faith. Newcomers to the DSP immediately ask about why take two poles and not, say four or just one. The next question may be a question about the number and location of zeros on Z plane… Oh well. It was just for experts! But seriously, the formula was really deduced in simple way by me. The process of deduction I share with you. What do you get as a result? Simple recursive formula, which can be used to generate a sine wave without need to call trigonometric functions from the library, which by the way, will run slower at times comparing to the proposed method (which is, for example, for the controller is very important). This is really interesting fact that knowing two previous values of the sinusoid the next value can be easily calculated. As you can see, we’ve got an accuracy of 3 decimal places, which is good. # It is important to remember that one period is equal to 2*pi = 6.28 radians!!! Here, white dots denote a sine wave obtained using a recursive formula. 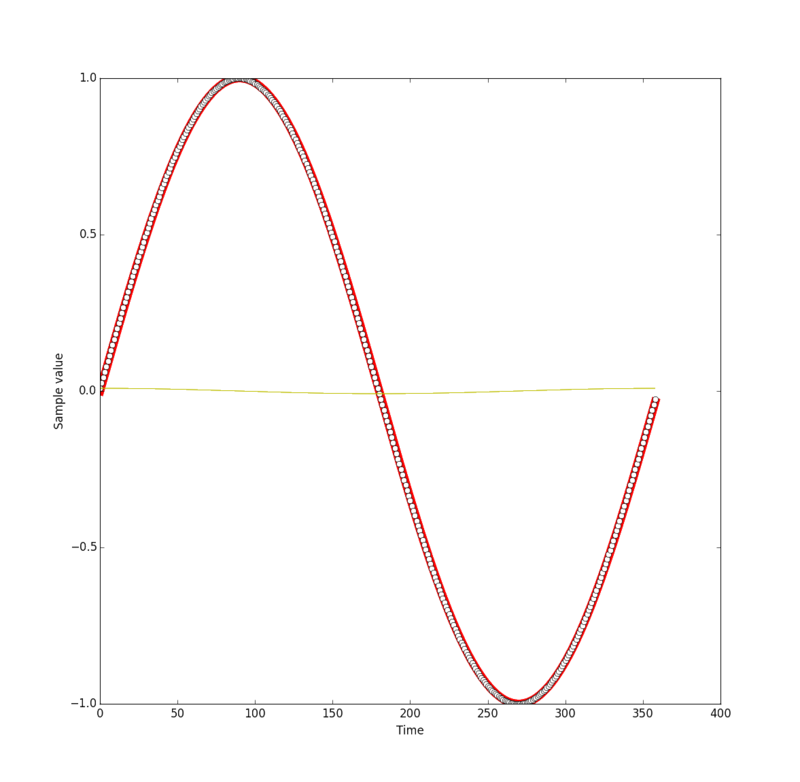 The curve marked in red, obtained by sine function from the library. 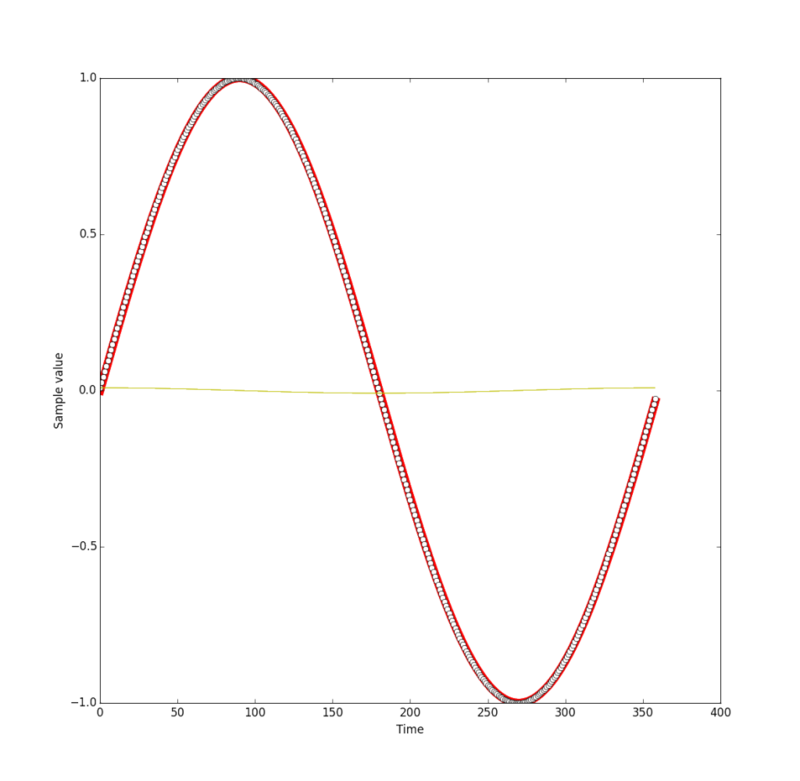 The yellow curve shows the difference between the two curves. As you can see, the difference is present, but not significant. But here, it’s pretty easy! As recursive formula has been successfully deduced, to work with it we need to have the two previous values. As a result I just took them manually (but using the same formula).